Total snow depth in the April 12, 2013 Rabbit Ears Pass snow profile was 72”, almost 5” more than observed at the site on March 20, 2013. Total SWE on April 12 was 25.8” and mean density of the snowpack was 354 kg/m3 (35.4% water content) versus 21.9” SWE and 321 kg/m3 mean density (32.1% water content) on March 20, 2013. The top 8” of the snowpack on April 12, 2013 consisted of recent snow containing dust-on-snow event D6-WY2013 (April 8). Underneath that layer a thick band of re-frozen melt-freeze polycrystal layers, interspersed with layers of ice, contained the D5 dust event that was underway during the March 20 site visit. 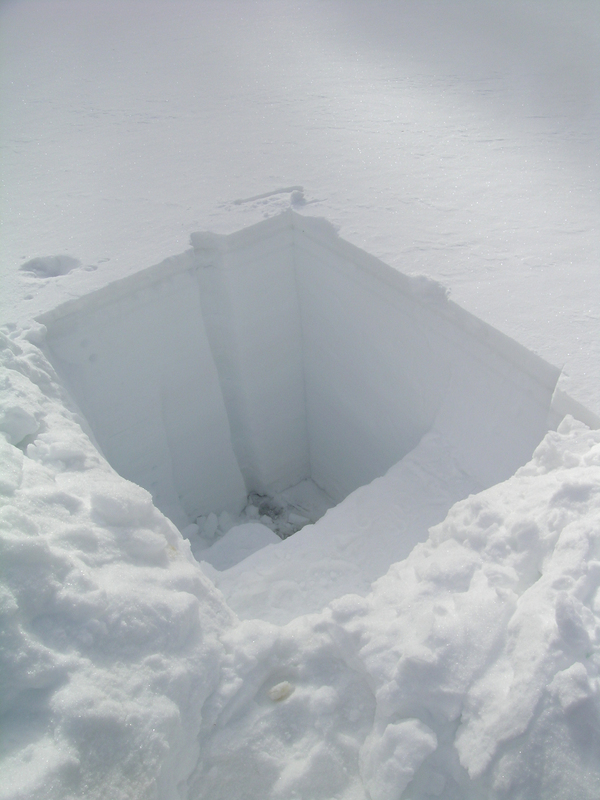 Most of the snowpack was either moist or near-wet and all layers showed evidence of recent wetting, by percolation of free water from the surface. Aside from cool snow at the surface, most of the snowpack was isothermal at 0.0° C, so mean snowpack temperature in this profile of -0.6° C, as compared to -3.9° C on March 20, 2013. April 12, 2013 Rabbit Ears Pass Snotel data reports current SWE near the bottom of the lower quartile of SWE values for the period of record. Although slightly higher than the same-date value recorded in WY 2012, SWE at this Snotel site is still well below the 1971-2000 mean. Winter storms in March and early April have resulted in the Rabbit Ears Pass CODOS site retaining 42” more snowcover and 13” more SWE than was present on April 10, 2012 and nearby Snotel data also show more SWE than on the same date in 2012. Site differences – shady Snotel sites versus CODOS sites with much greater solar access – are likely to result in significant differences in snowmelt timing, as discussed in the WY 2012 Season Summary. The upper April 12 snowpit showing D6 entrained in recent snow as a brown band just above the thermometer case, and the older D5 melt-freeze polycrystal crust just below the thermometer case. 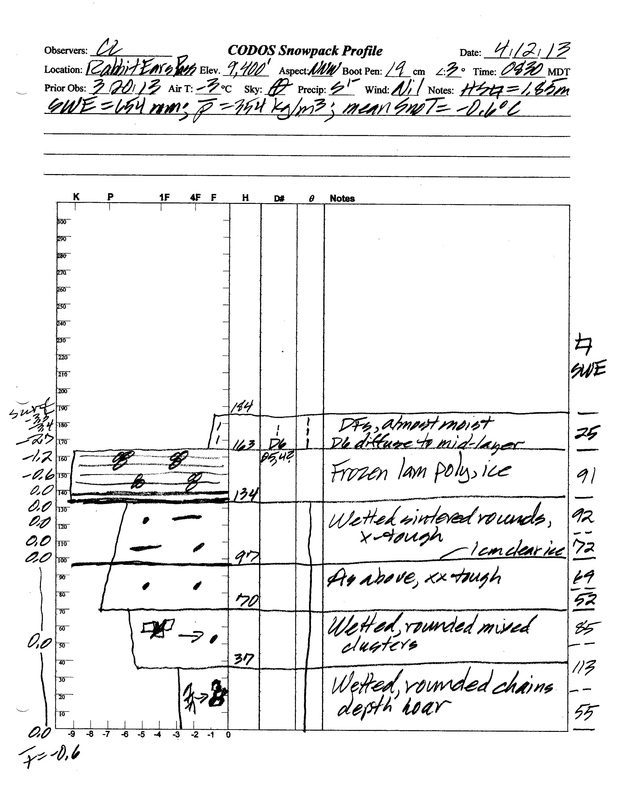 The dark layer below is clear ice, the result of free water percolating down through the overlying layer and pooling at an abrupt change in density (a new layer), then refreezing at a temperature very near 0 C. No dust layer corresponding to layer D2 at Senator Beck Basin is seen in this (or the preceding) profile. 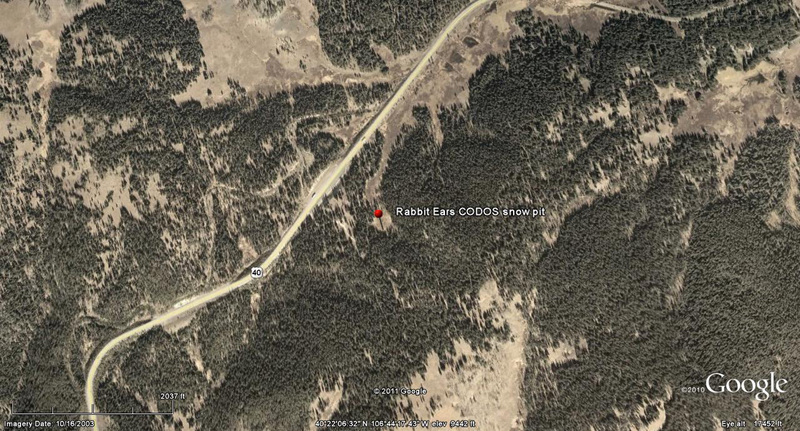 Rabbit Ears Pass CODOS snow profiles are performed some 100 yards from the same-named Snotel, in the center of a large wetland clearing where contamination of the snow with tree debris is reduced and solar radiation can reach the snowpack. The prepared April 12 snowpit, ready for the observer. 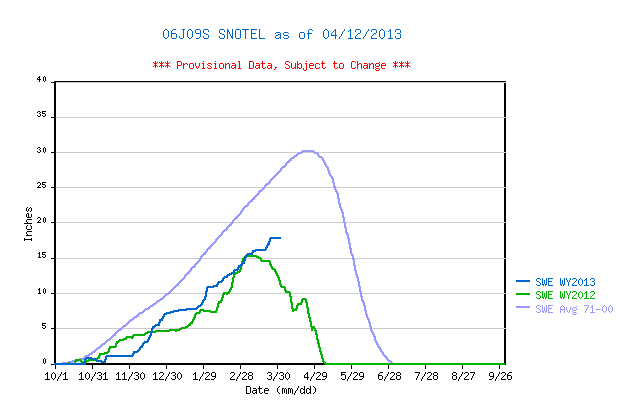 The Rabbit Ears Pass Snotel site has not reported new data since late March. However, the nearby Columbine Snotel shows continuing accumulation without significant losses of SWE, do-date. Despite gaining SWE, the April 12 snow profile at the Rabbit Ears CODOS site also found evidence that episodes of surface snowmelt, enhanced by dust event D5, had occurred and that free water had percolated through and reached the base of the snowpack. Dust layer D6 had not yet emerged or received enough radiation through the overlying snowcover to produce snowmelt in the snow containing D6. Since the site visit, the Rabbit Ears Pass locale has received another layer of fresh snow that will, once again, restore a higher snow albedo and delay the inevitable full emergence and impact of dust layer D6 on snow albedo. As and when D6 does more-or-less fully emerge, and remain exposed for some days, snowmelt rates will accelerate on the Rabbit Ears Pass plateau. 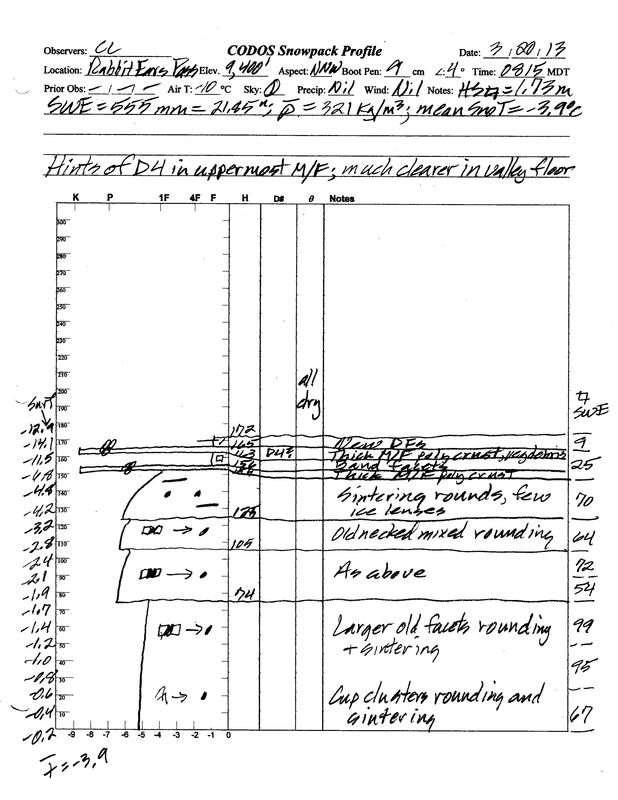 The sustained exposure of merged dust layers D5 and D6 could result in SWE loss rates exceeding those observed in spring 2012 (when SAG arrived at the Rabbit Ears Pass Snotel before any dust events comparable, in intensity, to D6) and may more closely resemble the rates observed in WY 2011. Ablation of this season’s sub-par snowpack to “snow all gone” (SAG) could also be significantly advanced by merged layers D5 and D6. Streamflow data from the USGS Yampa River at Steamboat Springs gauge show a substantial late March surge in flows, likely enhanced by the event D5 (March 21-22) dust that was observed on the valley floor snowpack surface during the March 20 site visit. That valley floor snowcover has since essentially disappeared, even as far upstream as Yampa and Toponas. This graph, captured on April 11, shows the dampening effect, on flows, of the storm and weather delivering dust layer D6 (April 8) and does not yet indicate the influence of event D6, since D6 has yet to significantly emerge on the remaining snowcover. Yampa River flows will surge again as and when D6 begins to emerge. As of Sunday, April 14, The National Weather Service expects unsettled weather to continue through most of the week of April 14-20, with snow levels dropping to higher valleys. A significant weather system is expected to arrive Monday, April 15 with strong SW’ly winds (Red Flag Warnings posted for southwestern valleys). A Winter Weather Advisory anticipates 8-14” of new snow, or more, in the Flat Tops and northern mountains. Partly sunny weather may return to the northern mountains by Friday, but no prolonged drying is anticipated at this time as the weather remains “progressive”, with an another potential system shaping up for next Saturday. Given additional new snowfall during the week of April 14-20, and without further dust-on-snow, the emergence of dust layer D6 will be aspect and elevation driven, with earliest exposure at lowest snow-covered elevations, but perhaps quickly followed at Pass elevations. Even on mostly cloudy days early in the week, sufficient radiation may reach the snowpack to penetrate the new snow layer, reaching the D6 layer below and accelerating the ablation of the new snow. Given the predicted additional new snow amounts, Yampa River streamflow data may not reflect the onset of D6-enhanced snowmelt until the following week, given drier and sunnier weather then.